I don’t normally drink coffee but I’ve drank a Vanilla Frappucino in a bottle given to me by my Big (thanks SiSi!). Class reunion of my Mini School yesterday evening involving the horror movie Hush, catching up with how everyone’s first year of post-secondary has been, and realizing that all of us are the same at the core. Shouldn’t have stayed up late writing that blog post last night but it was an important message that needed to be told especially as we are all tying up projects and jobs before going back to school soon. Despite this coffee and sugar, I feel like running away from this desk. I’m not meant for the desk life but this is necessary. I don’t want to edit stimuli and reprogram the experiment but I’m going to anyway. I’ll take this one step at a time. Let’s do this. 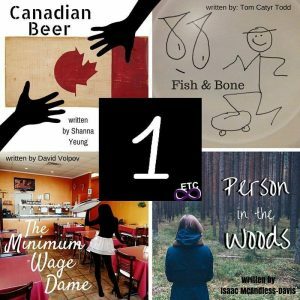 My play Canadian Beer premieres Monday!! 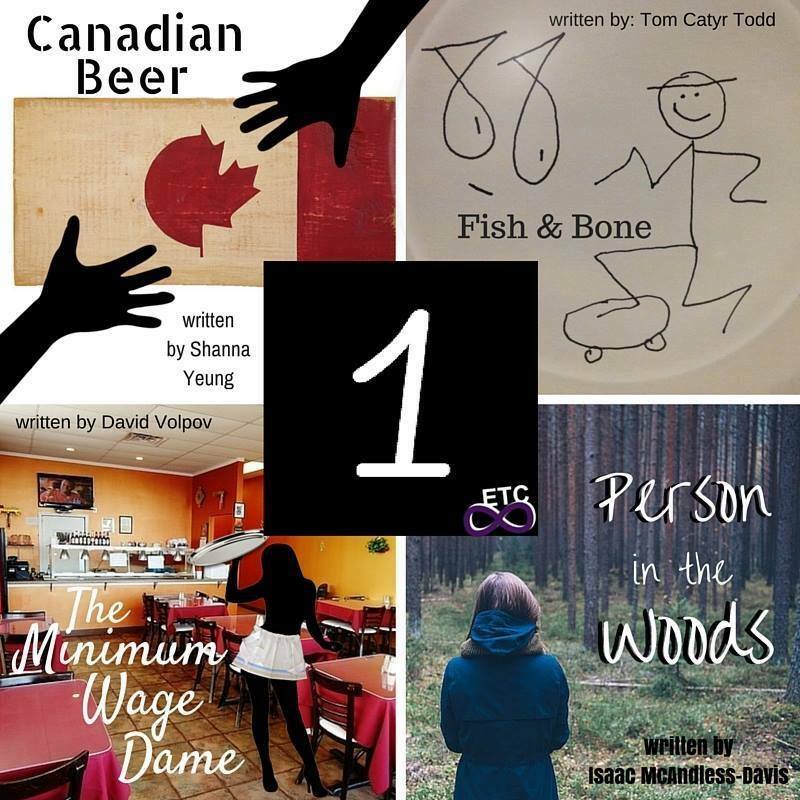 When I wrote this play, I dug deep inside my soul and found issues that I believe really needs to be talked about: racism and cultural identity. I hope that audience members can take away a message that discrimination, particularly racism, is complex and the way you interact with others is influenced by who you are and your own experiences. I hope that ‘Canadian Beer’ makes people think about racism and cultural identity in a new light. My play will be part of Eternal Theatre Collective’s very first new play festival. Square 1 will be taking place August 15th and 16th, 2016 at Studio 1398 on Granville Island! Square 1 includes four international debut productions by youth playwrights and will boast a cast, crew, design and creative time entirely made up of people between the ages of 13 and 25. 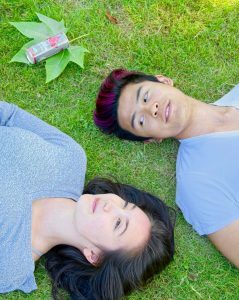 Come and check out the immeasurable talents of the Lower Mainland’s youth theatre community! 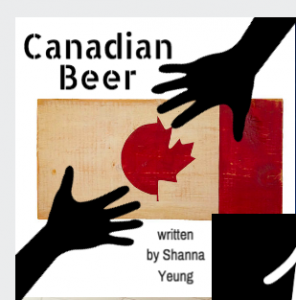 Author ShannaPosted on August 13, 2016 August 13, 2016 Categories First YearTags playwritingLeave a comment on My play Canadian Beer premieres Monday!! What I learned about myself today: I really like working with my hands to do fine detailed book. Today, the other girls and I worked with Don to process cedar bark to weave cedar braids. I love working with the knife to strive towards long smooth strokes, deep but not too deep, finding the balance between putting down enough pressure but not so much that you’ll split the inner bark prematurely, finding that perfect angle. I liked being really cautious to the fine detailed work of cutting off the last bit of outer bark. I also enjoy weaving the cedars strips into braids. So overall, I loved all the work (more fun than work) we did with our hands today. So as I’ve thinking about possible future careers lately, I’m applying what I’m learning about what I like and don’t like to think about what I’d like my future career to involve. I do enjoy talking to people but I’d like my job to involve at least some procedures. I definitely like to take an active role rather than just watch. Don complimented my patience working with the knife and said that I would do well tanning hides. I’ve never tanned hides before but I would love to try! Maybe next week. This morning, we hiked up to and around Hicks Lake. We ate different varieties of wild berries and Don taught about us about plants that can used medicinally or eaten. You may have studied well in advance, hiding out in your room/the library/etc, foregoing the temptations of the beautiful weather outside, turning down invites from friends and family, for the sake of this exam that is worth 85% of your mark. 85% someone asked you. Are there really final exams worth 85% of your mark? Well you just wrote that 85% of your mark final 15 minutes ago. The massive cramp in your right forearm tells you that you haven’t been dreaming. I heard a quote that was something like “You try really hard. Do the best you can. And still fail” because that’s life. Ok, sit down. You’re not going to fail. You knew how to answer the questions. You just feel frazzled because you were writing non-stop for 3 hours straight. You felt rushed for time AGAIN. Note to self: Go seek help from SPAC or PAC for advice on how to be efficient with time when writing written answer/long essay style exams. These written answer exams are clearly not your forte since you love to write on and on and never know when to stop until you run out of time. You live and learn. In the big picture, exams are absolutely NOTHING compared to the challenges that some people face in their everyday lives. But hey, if you feel down, it’s okay. It’s okay to feel weak sometimes. Go take a break. Yes, take a break even though you have another massive 60% of your mark exam tomorrow. You deserve a little reward. Spend that food giftcard you can’t remember which volunteering/work gig you got it from and buy yourself something warm to eat instead of the cold salad you’ve been having for the last few weeks. Go something you enjoy. I’m writing this blog post but do whatever interests you and makes you happy: cook, go for a run, go see your boyfriend/girlfriend, play tennis as long as you like it and it’s relatively short. Sorry it has to be short because you’re going to return back to working hard. You chose this life because you wanted an education. You have a destination to get to so start hustling. What: Own glasses that you’ve outgrown or no longer match your prescription? Drop off your old glasses to save another’s sight! Collected eyeglasses will be donated to people in need. Accepting prescription glasses, reading glasses, and sunglasses. Children’s glasses are especially needed so feel free to contribute your glasses from way back or your younger sibling or child’s glasses. Thank you for contributing to this mission of saving the sight of others!! When: Tuesday April 5 – Friday April 8 Collection bin will be there all day. Club representatives to answer your questions Tues/Thurs 11 am – 2 pm . 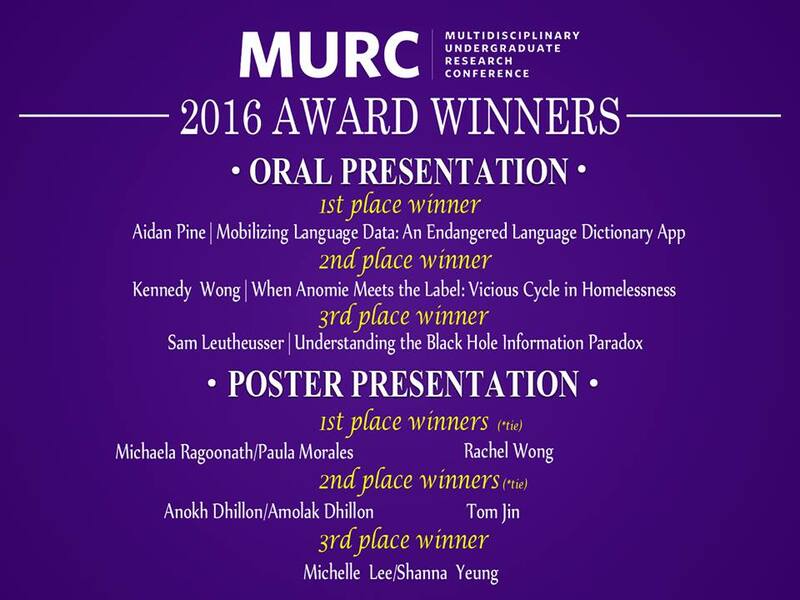 MWF 11am – 1pm and 2-4 pm. Where: Our booth in the Nest. Anyone interested in donating that doesn’t attend UBC: feel free to pass your glasses donations through someone else who goes to UBC or email me at shannyeung@gmail.com and I can try to arrange a pick-up from you. Thank you for contributing to this mission of saving the sight of others!! 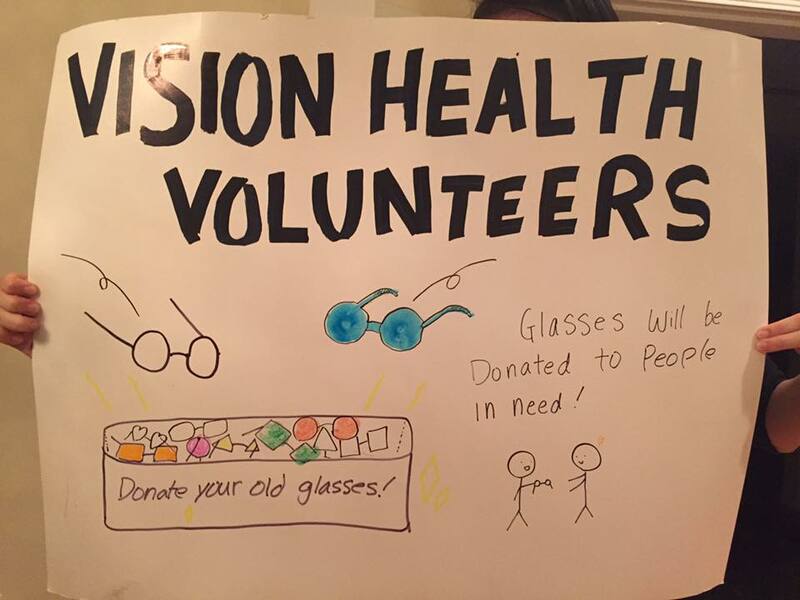 Who: Vision Health Volunteers! Come hang out and ask any questions about where the glasses are going to, about our club or about the volunteer opportunities. – JUNE/JULY Assisting with VocalEye at the Celebrations of light, Bard on the Beach, the Pride Parade and more. For details, pick up our pamphlet for what each role involves and how to volunteer with us. Your pamphlet will be made by the fabulous Alyssa. Poster made by the fabulous Misaki. I was estatic to receive an interview invite from a program I think is such an amazing learning opportunitiy and cultural experience. 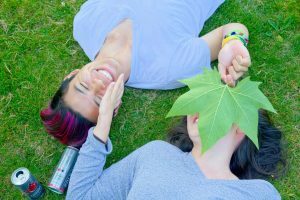 The program allows you to live and learn in an Aboriginal community in BC for a month to be fully immersed in that community and work in an interprofessional team on health promotion projects and job shadow and participate in cultural activities. The combination of healthcare and cultural learning sounds to me like a dream experience. I’m still super interested in Aboriginal Health so I’ll apply again in future! Any tips on how to succeed at interviews?